The brothers in Rebecca Zanetti’s Blood Brothers and Sin Brothers series were genetically modified before birth to be super-warriors. The Sin Brothers series is complete at four books. 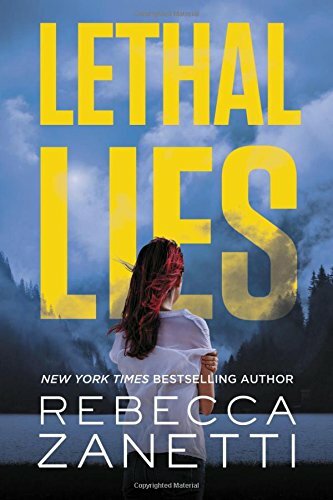 Lethal Lies is the second book in the Blood Brothers group but can be read alone. Characters from the Sin Brothers series make very brief appearances but play no major role in the book. Working as the Lost Bastards investigations agency, the Blood Brothers, who use the surname Jones, make most of their contacts over the internet or the phone. They live under the radar and on the move because the doctor who created them and the abusive sheriff who ran the home where they were raised are continually searching for them. The doctor wants their DNA to breed more advanced soldiers, and the sheriff wants revenge for the death of his brother, whom the boys killed when he was abusing one of them. The heart of the book, however, is the romance between Heath Jones, the lawyer among the brothers, and criminal psychology professor Anya Bast, sister of an FBI agent kidnapped by a serial killer. Heath has been working with Anya’s sister. He wants to catch the killer and protect Anya, a task made harder when Anya taunts the killer in the press. The FBI is also investigating this killer, and the agent heading their task force is involved with Anya’s sister. He also wants to protect Anya, but he and Heath don’t agree on how best to do that. In addition, Anya’s televised taunt at the funeral, with Heath at her side, has brought him into the very limelight he seeks to avoid. Heath’s brothers and the woman who will soon be his sister-in-law set up fake offices, a fake residence, and a hidden, safe apartment so they can use Anya as bait to draw the killer in. A soldier working with the doctor and the sheriff is tracking Heath and his brothers, drawing ever closer, and he has unique abilities of his own. In general, the story moves at a great pace. The tight relationship Heath and his brothers share is very appealing, and Anya displays courage and resolve that are admirable. The book has a lot of action and wrenching emotion. I loved the Sin Brothers series. Really looking forward to this one too. Never read anything by her but you make it sound interesting. Will have to add to my wish list. Thank you for the review. It sounds like she has given us another good, suspenseful read.